Snobby me is sooooo grateful. I am going to say some unkind stuff in this post. I have been a preschool teacher for nearly 18 years now. The CDC also provides child care for the rest of the day. (We don’t call it ‘day care’ because, as my former director said, we’re not taking care of days, we’re taking care of children.) My ire rises whenever someone refers to it as ‘babysitting’ because in my mind, babysitting is what you pay a teenager to do – come to your house and watch your kids. I have done presentations on how we do what we do, and to try to encapsulate it in a nutshell for this little post, well – here goes: We believe that every moment is a teachable moment. We, the friendly, educated, loyal staff, are providing positive, Christian, intentional care in the most home-like (and did I mention accredited?) environment possible while working with parents as partners. We mentor college students that are preparing for careers in early childhood education. I could go on and on, but I won’t. 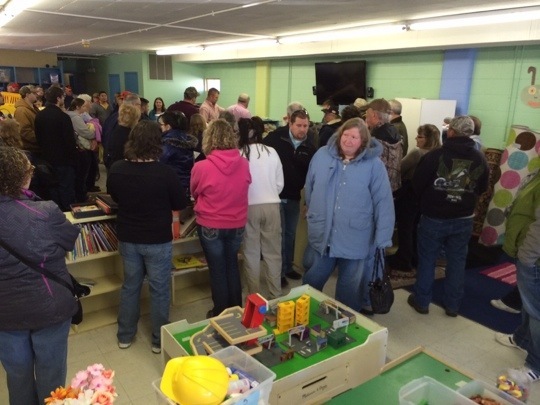 Today Lloyd and I went to Fremont where a closing child care center was holding an auction. Some of the things I will complain about are just me being snobby, but some are real sorrows. I didn’t like the decor. Places that are painted all kinds of colors drive me crazy. We try to make a natural, peaceful environment where the children’s work provides the ‘color’. I could smell bad smells. Seriously, it smelled like pee. The layout was sooo sad. It was a storefront property, so it was long and skinny with windows only in the front. The preschool room was gigantic and I imagine quite loud when filled with children. 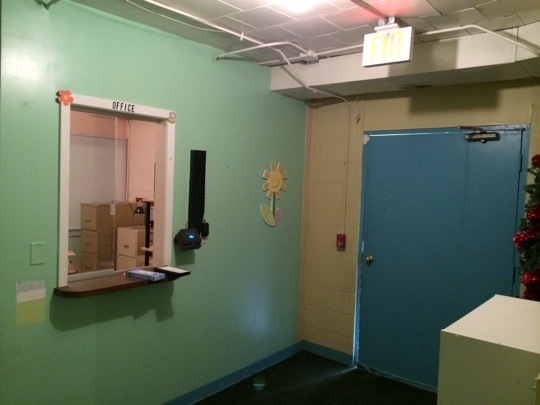 The toddler and infant rooms were 1/3 the building width (hallway dividing down the center of the building). 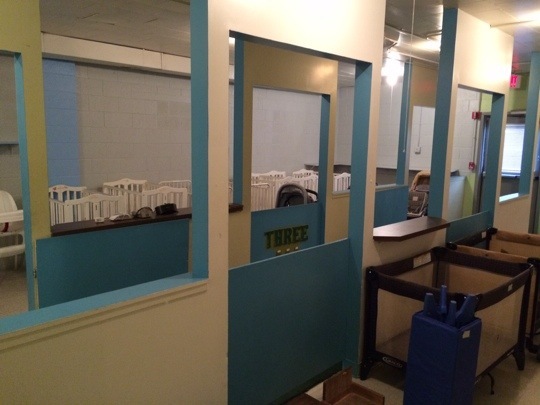 The infant rooms, while open, reminded me of a kennel. (I am not a fan of infant care. We have a local church that does this very, very, well, but they have smaller rooms with only 4 infants max in a room.) The main entrance/office? This. Since then we have moved to our current location, and while it may be a remodeled liquor store (click for a photo tour), it is a palace compared to what I saw today. My prayers are that children would never have to be in a place like that, but I know that’s not possible. By the way, I didn’t buy much. I went for some chairs, but only bought some clipboards and some skinny little ‘nap mats’ that we use as visual dividers at nap around our cots. I didn’t want any children sleeping on them. I have lots of respect for you guys having all the stuff that goes into having a great place for kids. (That sentence sounds awkward, but you know what I mean). That place looks so very cold and uninviting. More like a holding cell for young persons. Shame on them. And thank you, Lauren, for taking excellent care of little children, while teaching them the ways of the Lord! You are not being unkind….you are just speaking a sad, sad truth. God bless you & all those who have such a Godly mission for the little ones and faithfully live it out. Those children are blessed beyond measure. After looking at the pictures again, I am reminded (sadly) of the orphanage pictures from China. These pictures are slightly better. Oh, I think I could learn quite a few things from you!